September 19, 2014, 1:10 PM · It's a new Golden Age of violin- and bow-making, but how can you find those amazing modern violins that sound as good, hold up better and sell for a much more reasonable price than the old Italians? Here is one very good place to start: this list of the winners in the 2014 Violin Society of America Competition. I have provided as many links as possible to their websites, if you wish to connect with any of these makers. This year, the competition has attracted entries from 312 separate makers, representing 26 countries. There were a staggering number of instruments -- 25 judges evaluated a total of 542 entries, including 246 violins, 110 violas, 69 cellos, 9 basses, 80 bows, and 28 instrument quartets. Instruments were be judged over a three-day period for each category. The VSA's instrument contest certainly is an opportunity for luthiers and bow makers to get their name out by winning a medal, but it also brings together new makers with more experienced ones, and thus allows the opportunity for mentorship. 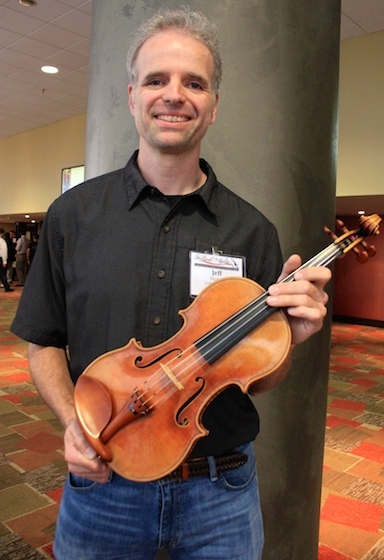 "It's such an opportunity for everyone to learn something," said luthier Christopher Reuning, who has served as a judge in the past. "Sometimes they are just this close to winning a medal, and there's just one little thing you can tell them -- then they come back and win the next year." After the judging, makers who entered the competition have chance to talk about their instrument with a judge. Below, judge John Montgomery reviews instruments with makers. September 19, 2014 at 11:19 PM · Mr. Phillips is consistent! He's won many times before. That violin he is holding, what do you think it will fetch? September 20, 2014 at 12:18 PM · Has anyone else noticed that there's only one woman on this list of honorees? Is it that there weren't many female entrants or what? It strikes me as odd. September 20, 2014 at 06:51 PM · Thanks for the cool writeup, Laurie. It was great to finally meet you in person.